Ever wish that you had more space in your garage? With Garage Evolution’s innovative garage organization solutions, now you can! Our garage design and organization services help residents in Manatee, Sarasota and Lakewood Ranch Florida to reclaim their garages and bring order to the chaos. Don’t leave your car in the driveway while your garage is filled to the brim with boxes and kids toys – take back your garage with our overhead storage and garage organization solutions. Make your garage space more efficient with custom-designed solutions from Garage Evolution. We can assess your space and provide a wide range of customized options to make your garage or workspace work for you. We offer everything from professional powder-coated welded steel cabinetry to slatwall organization wall panels, as well as Safe Racks overhead storage racks that can handle loads. We also offer car lifts to help you find a place for the extra car left in the driveway or that special weekend driver that could not only just be covered but kept up high protected from every day in and out traffic and also for the do it yourself person to take care of your vehicles routine maintenance with ease, and polyaspartic decorative flake floor coating – the most dependable solution for garage floors. If you need help making your garage work for you, let us help you clean up that mess and get the most of your space with our garage design and organization services. We serve homes all along the Gulf Coast, including Port Charlotte, Punta Gorda, Venice, Bradenton and more! To get started or to learn more, call us today at 941-724-7032. Contact Garage Evolution today for more information and add us on Facebook ! 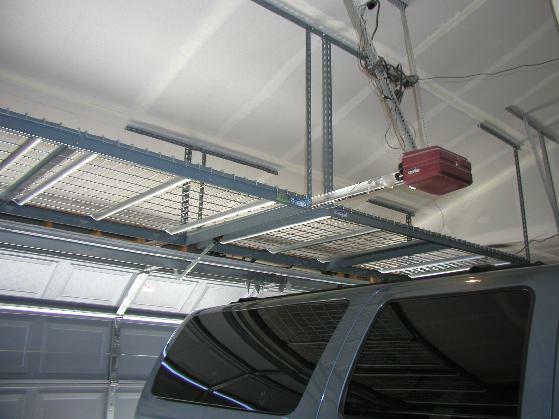 Overhead garage storage racks are the perfect solution for small and large items alike. Keep your things organized in the comfort of your home, rather than dealing with the inconvenience of traveling back and forth to storage sites.